Having witnessed the dire humanitarian situation in Somalia first-hand, the head of the United Nations refugee agency has appealed for greater resources to provide assistance to people in the drought-stricken Horn of Africa country. 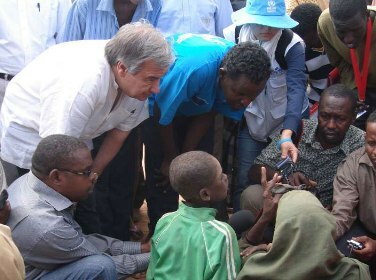 “I believe Somalia represents the worst humanitarian disaster in the world,” said António Guterres, the UN High Commissioner for Refugees, speaking to reporters yesterday while visiting the Dadaab refugee camp in eastern Kenya, where thousands of refugees continue to arrive, most of them greatly weakened by hunger and long treks from Somalia. “And that is why we need to do everything we can to make it possible to deliver massive humanitarian assistance inside Somalia,” said Mr. Guterres. The UN refugee chief saw aid workers in Dadaab, currently the world’s largest refugee settlement, race to identify those needing the most urgent care. Many arrive in such an advanced state of malnutrition and sickness that their health cannot be restored. Respiratory infections, malnutrition and diarrhoea have claimed the lives of many. In recent weeks Dadaab, along with the Dollo Ado camps in neighbouring Ethiopia, have received tens of thousands of people from Somalia, fleeing drought conditions exacerbated by conflict. Inside Somalia, crop failure, exorbitant food prices and lack of aid have made the situation desperate. The three camps in the Dadaab area, which hosted well over 300,000 people before the drought crisis, now accommodate nearly 400,000 refugees and have become severely crowded. The drought in the wider Horn of Africa has also affected Ethiopia, Kenya, Djibouti and parts of Uganda, with up to 10 million people in the region in need of humanitarian assistance. Valerie Amos, the Under-Secretary-General for Humanitarian Affairs, who visited Ethiopia on Friday and Saturday, called for longer-term measures to help those affected by the drought to rebuild their lives when the situation improves. “The need to do more now is urgent. But in addition we also need to plan for the longer term to help people rebuild their lives when the situation improves,” Ms. Amos told reporters in New York today. “Access to water and sustainable ways of harvesting rain water in particular need to be developed in drought-prone areas to reduce reliance on water trucking, which is expensive and unsustainable,” she added. Basic health services also need to be established to ensure that preventable diseases do not take a higher toll on weakened populations, Ms. Amos added. “We are asking our donors to do more for the Horn of Africa and they are coming forward. They have been generous and I hope that that generosity will continue and will increase. We urgently need a united approach to the relief effort so that we can avoid a descent into the famine-like conditions last seen in the 1980s,” she stated. In Ethiopia, where the Government estimates that 4.56 million people require humanitarian assistance, Ms. Amos said more children are becoming malnourished. “People have lost their livestock and now have no means of economic support. Everyone I met spoke of the lack of water and the impact it is having on their daily lives,” she said. Ms. Amos, who is also the UN Emergency Relief Coordinator, said that Secretary-General Ban Ki-moon will convene an inter-agency meeting tomorrow to review the UN response to the drought crisis in the Horn of Africa and to identify what more needs to be done.